Home » Digital Decoded » Ditch your Secretary, Google Now is here! Ok, I am sure your secretary has many perks, but on-the-go updates synced with your life is just too much to ask from a single human being. Today, Google Now is available as a chrome extension, thus completing the full circle in my digital life. I’ve been using the Google Now card system on my phone since I upgraded to Android a year ago (iPhone prior). It notifies me at perfect times when I should be leaving the house, what the latest Red Sox score is, who I am scheduled to meet, and much more timely information. “Timely” is the key word in this statement. The purpose of this product is to get the information precisely when you need it. Five minutes early or late would just not be as useful. Getting information at the RIGHT time is everything Google hopes to accomplish. All your information, all your data, all locked up and there for you to access fluently wherever you may be. This is the semantic web. This is Google Now. This is the future. Based on a card system like the screen shot graphic from www.engadget.com, you can decide what information you want displayed in a simple, concise manner. Tailored based on your internet habits, Google chooses your cards initially and will sync up live to what is occurring in each category. “She” may answer a few questions and she may be able to bring up your flight details. But she is not integrated with your google account and most likely will not let you know the exact time you should be leaving your home to catch the flight. This is the future, the ability to integrate perfectly in your life without ever asking. And that, that is freaking scary. What the Heck is Google Now? I like my Secretary! Google explains it as the right information at the right time. 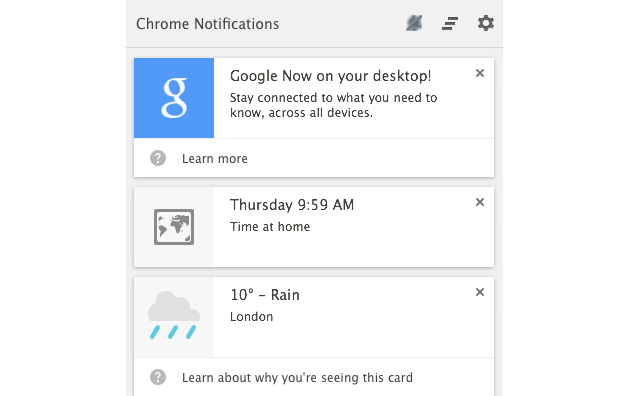 Chrome has just released the extension for Google Now to integrate with your web browser. If you are not already using Google Now on mobile you can download it here. It is expected that this list will be forever expanding, but for the time being Google Now works to give you the right information at just the right time for Flights, Hotels, Events, Travel Sites, Restaurant Reservations, Movies, and Real Estate. Notable companies include, Rotten Tomatoes, Zillow, Stubhub, Booking.com, and a few airlines. Have you ever used Google Now? Did you know that your android device is already most likely using cards as part of the service? Does this scare the crap out of you like the rest of us? Please leave your comments below and share this link to help Google continue to take over the world. Bottomline: The future is Now are you on board?